Enjoy the peace and tranquility of our early morning mass hot air balloon ascension VIP style! Savor a delicious hot buffet breakfast and a "Balloon-i” or mimosa along the flight line as 100 balloons take to the skies! VIP package includes festival admission all day (General Admission after 10am), breakfast in the VIP Breakfast tent (6am-10am), your choice of one "Balloon-i” or one mimosa, VIP parking, and lawn seating to the headlining concert. 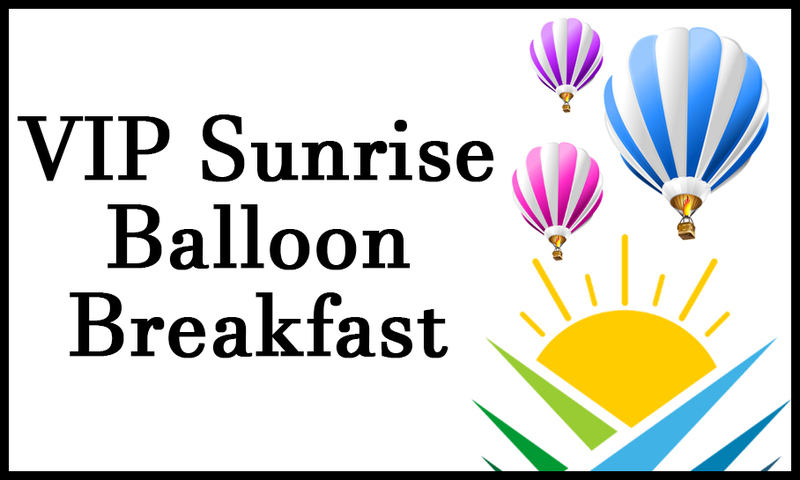 All VIP Sunrise Balloon Breakfast Tickets are non-refundable. For Ticket Policies, chick below. Tickets will not be mailed until June or July. The last day to purchase tickets online and have them mailed to you is Friday, July 19th. Tickets purchased after July 19th will be held at the Will Call booth and will not include VIP Parking.